This page is based on the Parallax (OEM) Basic Stamp II microcontroller. We plan to control a Mitsubishi M50530 based LCD display's. 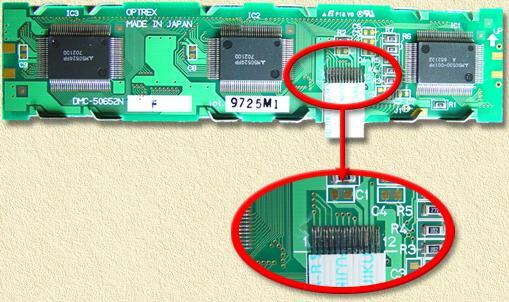 Tip: for Hitachi 44780 based LCD displays see the Optrex DMC2034 article. I'll try to explain how to connect such an LCD display to the (OEM) Basic Stamp II,, based on a used LCD display from an Ericsson phone (here we use the Optrex DMC-50652N or the Seiko/IIS C456002A) basically any Mitsubishi 50530 based LCD should work. Pictures of the LCD in action can be seen here. The displys I used, are an OPTREX DMC50652N (= Seiko/IIS C456002A) which has 3 x 40 (3 lines, 40 characters) chars. Note: I wouldn't have done this article without the help of Peter Pitzeier. He was the first one to get it running with a BasicStamp 1. Do not forget to read the disclaimer! Note: The example code can be downloaded HERE. Here we show you how to make the proper connections. For pin 9 of the LCD we will need to create a little powersupply adjustment. 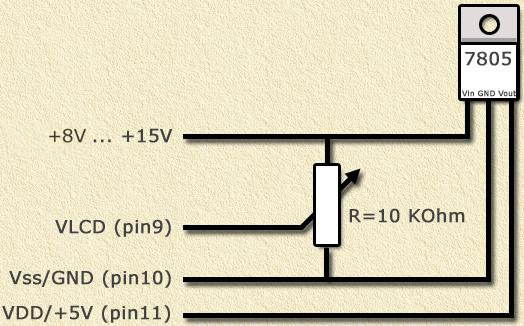 On average (milega may vary) pin 9 needs approximately +11 Volt on pin 9 to seen anything. Below you will find an easy to build schematic. This can also be used for powering your BasicStamp by connecting Vss (ground) and VDD (+5V) to the appropriate pins of the BasicStamp. Note: pin out is based on info I got from Peter Pitzeier - Many thanks Peter! OK, so now we hooked to LCD up to our Basic Stamp 2. How do we control a parallel controlled LCD panel by using only 6 wires? The answer is actually pretty simple (thanks to Jon's work): the LCD panel can be controlled using 8-bits or 4-bits. 4-bit mode is working identical to 8-bit mode mode, however we transmit the upper 4 bits and the lower 4 bits in sequence instead of 8 bits parallel. See the Optrex DMC2034 article for more details. Sending instructions is basically the same as sending characters, we only need to use different values for the control pins (E, IOC1, IOC2). To save you a lot of work, I create som subroutines that do this job for you. LCD_Init GOSUB LCD_Init Initialize the display. Write control instrcution. An instruction is 8 bit, binaire code. Define TheData as VAR byte. GOSUB LCD_WriteChar Send character to display. LCD_SetFunction GOSUB LCD_SetFunction Set communicaton and font settings. LCD_ClearHome GOSUB LCD_ClearHome Clear display and set cursor in home position. LCD_SetDisplay GOSUB LCD_SetDisplay Cursor mode (blink, underline, etc). GOSUB LCD_CursorXY Move cursor to line X (0, 1 or 2) and column Y (0 ... 39). Define TheCursorX and TheCursorY as VAR byte. LCD_CursorHome GOSUB LCD_CursorHome Like LCD_ClearHome, without clearing the screen. Note: For some of these functions, you will need to pre-define variables (see table). DATA "Welcome to Hansies OPTREX DMC50625N test"
DATA "The LCD is connected to a BasicStamp II!" DATA "-= Enjoy the BS2 code for LCD control =-"